Tumbaga was used in pre-Columbian times from Mesoamerica to Peru and Chile as a generic term for any combination of gold and copper. It could range from 95% copper to 95% gold, although tumbaga or guanin gold was usually made by adding 10 to 30% copper to gold. Tumbaga usually contains 5 to 10% silver as well, which occurred naturally in the gold and wasn’t intentionally added. The amount of gold used in tumbaga depended on the metal’s availability. 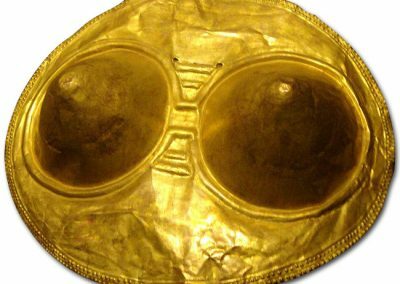 Objects from gold-rich areas like Calima and Tolima in Colombia, for instance, contained purer gold while most surviving pieces from the Muisca and Tairona regions were smaller, less pure and depended on gilding for appearance. There were several reasons tumbaga was popular. 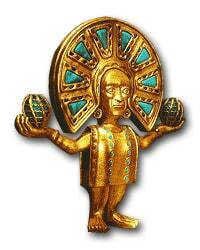 A primary one is that 70% gold/30%copper will melt at around 800 C., much lower than gold or copper separately. That’s important because melts were done in large clay pots using a team of men huffing on blowpipes. Molten metal then flowed from a hole in the bottom of the vessel into open molds made from stone or clay. These molds have been found archaeologically from Mexico to Chile. 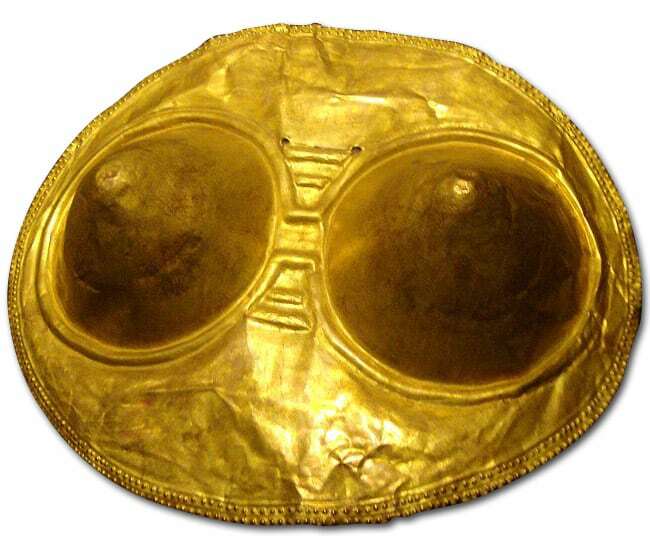 Tumbaga pectoral, Quimbaya culture, 300-1600 AD, Antiquia, Colombia. The lost wax casting techniques of these peoples were very sophisticated. They routinely cast hollow objects and bi-metal half silver-half gold objects using complex one-time molds made of ground charcoal, sand, and clay. Clay, powdered charcoal and usually a little sand were mixed, then moistened and shaped into the desired form. It was dried in the sun for a few days to drive out moisture. Then beeswax was mixed with copal resin (for hardening) and rolled into a thin sheet that was shaped around the clay model “core”. Decorations were then incised into the wax. Depletion gilding was routinely used to decorate the surfaces of objects made from low-gold alloys. Tumbaga had another interesting use as well. Some cultures like the Moche in Peru placed small tumbaga ingots in the mouths of their high-ranking dead prior to burial. I’ve encountered this same ritual using various metals while studying the burial practices of several other ancient cultures around the world. Its significance is uncertain. 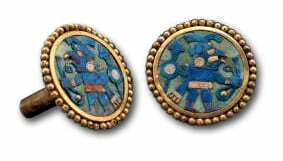 The Moche were astonishingly skilled goldsmiths and lapidarists, able to drill consistent straight holes in quartz crystal beads and ultra-tiny holes in turquoise disks. They used only stone tools but were able to accomplish amazing things.